How will I obtain permits to keep native plants and animals? Where can I obtain native plants and animals? How much water will a pond need and what will that add to my monthly water bill? How will I keep out nonnative species? Will my pond attract mosquitoes? What will become of my pond if I ever sell my house? Special permits are required for taking native plants and animals from the wild and keeping them in your pond. For example, the longfin dace, a native stream fish that does well in ponds with moving water, is protected by the state of Arizona. You will need to apply to the Arizona Game and Fish Department for a Wildlife Holding Permit without any guarantee that you will be granted one. With federally protected species like the Gila topminnow, it gets even more complicated in that you will also need to apply for a Safe Harbor Agreement without any guarantee that it will be granted. When you apply for a permit, a State biologist will need to evaluate conditions at your site, file compliance paperwork with federal endangered species managers, locate a source population with excess animals and move them to your site. Then each year they will have to make periodic visits to add new animals, monitor habitat conditions and file compliance reporting. Each pond the state issues permits for, generates hours of workload obligations for their employees. With budget cuts and hiring freezes the department simply doesn’t have the staff to accommodate the public demand for native aquatic species. Hopefully this is only a temporary problem and will become more feasible within the next few years. Native wildlife can only be transported and released into your pond by Arizona Game & Fish biologists. If you live near wild frog populations, they might turn up on their own. Toads living in your area are also very good at locating new breeding sites. Native aquatic plants are protected and should not be taken from the wild without permission. Aquatic plants are often easily started from plant cuttings or seed and can be acquired that way. Check with other native pond owners to propagate plants from their ponds but rinse thoroughly to get rid of any hitchhikers. Evaporation rates for Tucson are 100 inches per year. A typical 10 foot by 8 foot pond will roughly loose 5000 gallons per year to evaporation. At current 2009 Tucson water rates, that will add around $40 per year to your water bill. If your pond is isolated enough, you might not ever get invaders but chances are there is a source population closer than you think. Make sure storm water does not flow into your pond. To protect your pond from invasive animals like frogs and turtles, build a barrier to keep them out. 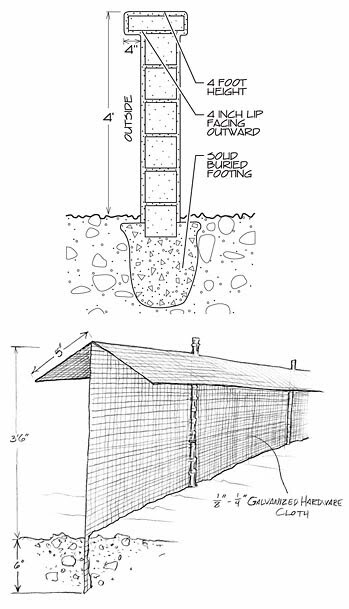 If the yards already walled in, retrofit all openings like gates and drainage holes with ¼ inch metal mesh. Walls will need to be at least 4 feet high and smooth textured. As a less expensive option, a fence can be erected out of ¼ inch hardware cloth. Even a pond with a tight barrier will need to be monitored regularly especially during the late Spring and mid Summer months. Bullfrogs can be identified by the males call, a deep “br-wum” and both sexes usually let out a “PEEP” when startled as they plunge into the pond. Set a spotlight at an open end of the pond at night. The frogs in your pond will gather around the light to eat the insects attracted to it and can be easily approached from behind the light allowing for close observation. Keep a watchful eye on the pond when using the spotlight since predators might also take advantage of the easy approach to the frogs. Mosquito fish and crayfish can sneak in with pond plants. Take great care in transferring anything to your pond that might have been exposed to invasive pests. Keep a close watch on the fish in the pond watching for any individuals that might be of a different species and use a flashlight at night to look for night active crayfish along the edges. Mosquitoes are attracted to moisture and lush aquatic plants. Your pond will be a mosquito magnet and due to human health concerns it is necessary to incorporate mosquito control in all man-made aquatic habitats. Native fish are the preferred method with topminnow species (Poeciliidae) most efficient. The most available species in our area, the Gila topminnow (Poeciliopsis occidentalis occidentalis), is federally protected making it difficult to obtain. A good alternative is the less protected longfin dace (Agosia chrysogaster), but dace require moving water and are more susceptible to water quality issues. Under no circumstance should the nonnative mosquito fish (Gambusia affinis) be used. This invasive fish will eat frog eggs, will eliminate native fish and is a major threat to aquatic wildlife worldwide. With such great potential for a native pond to get taken over by nonnative species, long term plans need to be considered. In the event that the pond is no longer cared for properly, it could quickly become a breeding habitat for problematic plants and animals. It is for this reason that you should consider filling in your pond if you end up vacating your property. The State wildlife biologists can help you relocate any protected organisms to new habitat or facilitate moving the plants and animals to your new property. Never release wildlife or plants into the wild. Introductions of plants and animals have a terrible track record of unintended results. Captives are often exposed to diseases that could wipe out an entire wild population. For this reason the Arizona Game and Fish Department has developed a complex procedure of disease screening and environmental assessments for releasing wildlife into natural areas. Either a formal block wall with a smooth surface or an inexpensive wire mesh fence can keep most invaders from entering your pond. 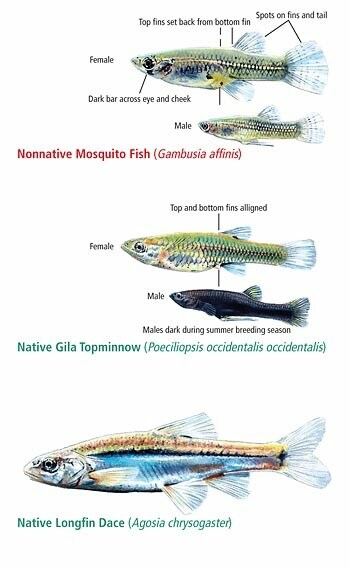 The environmentally dangerous mosquito fish looks very similar to our “endangered” Gila topminnow. Arizona Game and Fish only requires a wildlife holding permit for the less protected longfin dace but these stream fish require running water to reproduce.